OMG Chez..wow so glad u are staying on top of things as best as you can..Know it has all been alot on you.I told you my dear friend you rock,you are the one to know your body and guess you are right that you have to keep you alive.Thanks that Meg could help you also.Chez it seems like it takes so long for you to get answer but they are there. Many Many gentle Hugs and lots of love come frome miles across to my dear special friend..
Oh thank you Mandy. I would love nothing more than to get off the Oxy. I cannot believe the amount hubby was taking and survived. thankfully, I hate it and have no problems reducing my intake. Matt is a champion! He could only have done what he did with your love and support my friend. My current problem appears to have been caused from the Dicloxacillin but even the pharmacist refused to adknowledge the problem. Next call - the doctor. Really unfortunate that your longtime doctor would take such a position...not very supportive to say the least! Even when HOPE and FAITH is all you seem to have, maybe at that juncture in your life, that is all you need. It's very clear you have always maintained these and it's also good to see how diligent you are at seeking answers. Mandy, you may have to overlook the typing errors; more of them these days which makes for interesting reading. Sean, your comments remind me just how much I miss the regular communication we enjoyed in the past. Dr DeSouza's comment appeared out of character for him. At the time I simply did not have the energy to question him. I simply exited and used another door that opened to me. Good to see that you are able to detect what is going on in your body. Keep fihghting girl. Your angel flower is wonderful. Hopefully she will look after you. Oh Chez. What a time for you. I will pray too. Here you were today when I came to see if you wrote again...I see I am a few days late in getting here...I so love your attitude and how you listen for the signs of what is happening inside your body! Jeremy has a way of getting your attention and making you take a long hard look...even if it is in the toilet! lol....Unreal how the pills were just going through you whole!!! No wonder you are in such pain! Now we have to pray that the patch works at a low dose and it solves this pain problem. Have you still got the tests scheduled for this week? They were for Mon. and Tues. right? So hoping they turn out good and nothing else to have to deal with for you. I love your new plant...ANGEL WINGS....Not only is it beautiful, but another sign that ANGELS are watching over you! You have chosen to LIVE your LIFE as best as you can...You, my friend are doing just that. My prayer is that your quality of life will be satisfactory for you or even better yet....excellent!!! Big hugs sent your way and looking forward to your next post or your next email! Diane, I have learned that it does not always make me best friends with my doctors, but it does mean I stay alive which is what it is all about. Glad to be back on these pages ..
Debby this has been a particularly tough week and yet I am still smiling. Life is still good ..
Oh Diane so much has happened this past week. Patch was removed so I will do a Post on the details once the testing is through. It is lovely to find you reading the entries as I Post. You can never know the strength I gain from knowing that you, and others, are following my ramblings. 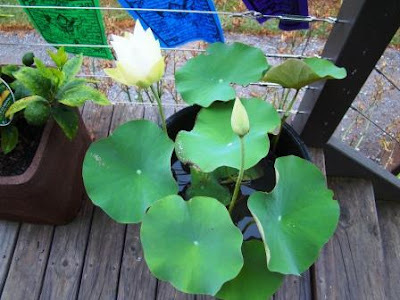 My Angel Wings Lotus Flower does not last long when it blooms but it has great meaning and keeps budding up. It is just in a cheap plastic pot too. Love it.